Showing 1 - 4 of 4 Products for Suspension Leaf Spring Block Kit. Skyjacker(R) utilizes Blocks and U-Bolts in its Kits to provide rear lift. The Skyjacker(R) U-Bolts are e-coated for corrosion resistance. These U-Bolts are offered in various shapes and sizes such as square, round, and semi-round in lengths ranging from 1.75 - 19 inches. 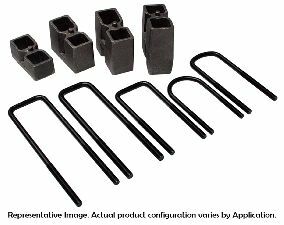 The Blocks used in Skyjacker(R) Kits are Ductile iron with fixed center pins. They are also tapered to correct pinion angle and prevent driveline vibrations. Available in 1.25, 2, 3.5, 4.5, and 5 inches.